Today, he considers the Broad Street Ministry on South Broad Street home. During the day, he sits at 15th and Walnut streets accepting donations from strangers to get by. He wants to get into a detox program, but said the lack of insurance has made that impossible. 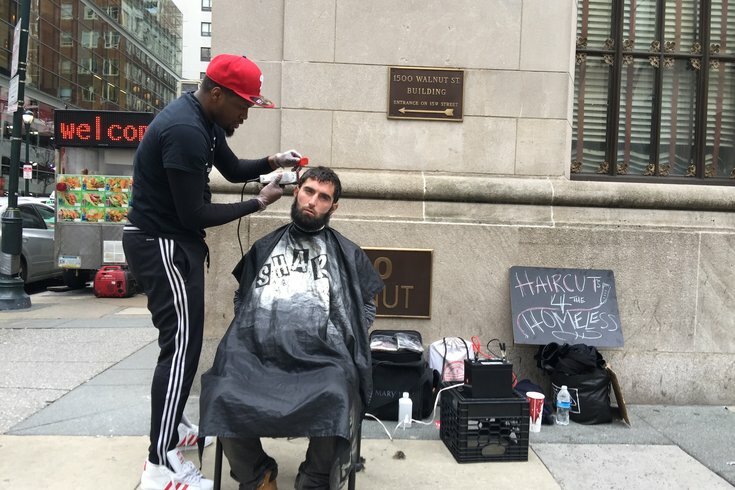 Around lunchtime on Thursday, a traveling barber named Brennon Jones saw him sitting at his regular Center City corner. After watching passersby pretty much ignore Day for a few minutes, he approached with a question. “Do you want a haircut?” he asked. It’d been a while since Day had one. He knew his hair “looked like a mop on top of my head.” The answer was a shocked and grateful "yes." 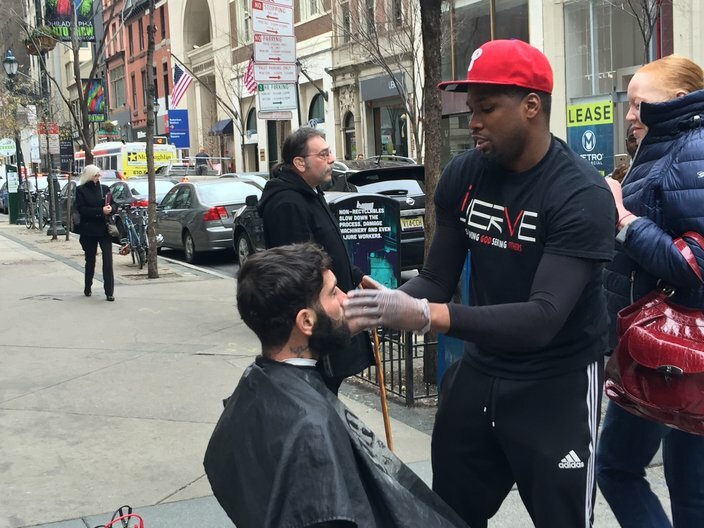 “I was completely blown away that someone wanted to do something nice for me,” said Day, whose hair would soon blow away down the Center City sidewalk. Sporting a “Serving God, Serving Others” shirt, he hooked clippers up to a car battery that he purchased after a GoFundMe push met its $1,000 goal within a week, broke out his scissors, and got to cutting hair. “So many people walk by and don’t even acknowledge these guys who need help. They look down on people they don’t even know,” explained Jones of what inspired him to approach Day after a homeless man across the street declined his offer. Brennan Jones, a barber who moved from Chester to West Philadelphia last year, said he will travel across Philadelphia and neighboring towns to give haircuts to as many homeless people as he can in 2017. Overwhelmed by the response to his #Haircuts4TheHomeless, Jones handed Day a collection of toiletries – also purchased with GoFundMe donations – and spoke about how the effort will continue throughout the year in Philadelphia and neighboring municipalities. Moments after Day checked out his new do in a mirror that Jones held up for him, the client said the random encounter gave him faith in the kindness of strangers, many of whom approached his stylist to hand him money and laud his compassion. That played into Jones’s ultimate goal. Though he’s already raised $50 more than the original goal, Jones’s GoFundMe page is still active.